RelaDyne, one of the nation’s leading providers of lubricants, fuel, diesel exhaust fluid (DEF), and industrial reliability services, announced plans to feature its latest varnish mitigation services and technologies at NPE2015: The International Plastics Showcase. Encompassing more than one million net square feet of exhibit space, NPE2015 is the world’s most important trade show and conference for the plastics industry. 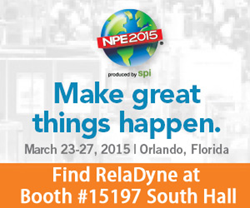 As an NPE2015 exhibitor, RelaDyne will join more than 2,000 leading suppliers from all sectors of the plastics supply chain, including end-user markets and consumer brands. More than 60,000 plastics professionals from over 120 countries are expected to attend the triennial event, to be held March 23 – 27, 2015, in Orlando, Florida. “We are excited to be showcasing our varnish mitigation solutions at NPE2015,” said Dan Oehler, RelaDyne Vice President of Sales and Marketing. Doug Muennich, RelaDyne Reliability Sales Specialist and Business Development Manager, said, “We know a lot of plastics-related companies can benefit from our reliability services, and we are thrilled to show them our services.” Both Dan and Doug will be attending the show along with other RelaDyne associates. RelaDyne’s exhibit at NPE2015 will bring added visibility to the company’s latest offerings, including its proprietary Varnish Mitigation Solution that removes harmful system varnish from lubrication systems. The process address varnish as a holistic approach to remove lubricating oil varnish and system varnish without interrupting customer production, bringing long term varnish solutions to RelaDyne customers. RelaDyne’s booth #15197 will be housed in the South Pavilion, one of 17 technology pavilions highlighting the latest innovations and technologies in the industry. NPE2015 also offers a world-class education program focusing on the latest technology trends and business solutions to help companies streamline operations and improve profitability. RelaDyne, headquartered in Cincinnati, Ohio, is an industry leading lubricant, fuel, and DEF distributor providing customers with integrated reliability management services for industrial and commercial businesses in the United States. RelaDyne was formed in 2010 by the combination of four industry leaders – Mid-Town Petroleum, Inc. (Bridgeview, IL), Oil Distributing Company (Cincinnati, OH), The Hurt Company, Inc. (Houston, TX) and Pumpelly Oil Company (Sulphur, LA). RelaDyne’s distribution platform spans 26 locations serving states in the Central US. In May 2014, RelaDyne’s industrial services business expanded with the acquisition of Turbo Filtration Corporation (TFC), enhancing their offering to key industrial customers throughout the US. The company also benefits from the support of its business-building financial partner, AEA Investors LP, which manages funds worth approximately $6 billion of invested and committed capital. For more information, visit http://www.RelaDyne.com. The International Plastics Showcase is a triennial exposition owned and produced by SPI: The Plastics Industry Trade Association. NPE2015 is the largest plastics industry event in 2015, hosting over 60,000 industry professionals from 120 countries and bringing the plastics industry together like nowhere else. It offers multiple educational programs and a world-scale trade show with 2,000+ exhibitors and over one million square feet of space (93,000 square meters). The event takes place Monday through Friday, March 23 – 27, 2015, at the Orange County Convention Center in Orlando, Florida. Visit http://www.npe.org for more information.